Definition at line 43 of file CNormalProduct.h. Definition at line 54 of file CNormalProduct.cpp. Referenced by copy(), createUnitProduct(), getDenominator(), and setDenominatorsOne(). Definition at line 60 of file CNormalProduct.cpp. Definition at line 94 of file CNormalProduct.cpp. Definition at line 438 of file CNormalProduct.cpp. Definition at line 507 of file CNormalProduct.cpp. Returns a product that is 1. In this case it only creates a new product instance with new. Definition at line 746 of file CNormalProduct.cpp. Referenced by CNormalSum::createUnitSum(), and CNormalSum::simplify(). Definition at line 669 of file CNormalProduct.cpp. References CNormalSum::add(), CNormalFraction::checkDenominatorOne(), CNormalProduct(), CNormalGeneralPower::getLeft(), CNormalGeneralPower::getType(), mItemPowers, CNormalGeneralPower::multiply(), CNormalGeneralPower::POWER, CNormalItemPower::POWER, pResult, CNormalFraction::setDenominator(), CNormalGeneralPower::setLeft(), CNormalFraction::setNumerator(), CNormalGeneralPower::setRight(), and CNormalGeneralPower::setType(). Retrieve the factor of this product. Definition at line 424 of file CNormalProduct.cpp. Referenced by CNormalSum::add(), convertToCEvaluationNode(), createSum(), multiply(), compareProducts::operator()(), CNormalSum::simplify(), test_biomodels217_expression::test_term_den1(), test_biomodels217_expression::test_term_den2(), test_biomodels217_expression::test_term_den3(), test_biomodels217_expression::test_term_den4(), test_biomodels217_expression::test_term_den5(), test_biomodels217_expression::test_term_den6(), test_biomodels217_expression::test_term_den7(), test_biomodels217_expression::test_term_num1(), test_biomodels217_expression::test_term_num2(), test_biomodels217_expression::test_term_num3(), test_biomodels217_expression::test_term_num4(), test_biomodels217_expression::test_term_num5(), test_biomodels217_expression::test_term_num6(), and test_biomodels217_expression::test_term_num7(). Retrieve the set of itempowers of this product. Definition at line 433 of file CNormalProduct.cpp. Referenced by CNormalLcm::add(), contains_necessary_mass_action_elements(), convertToCEvaluationNode(), multiply(), normalize_variable_names(), compareProducts::operator()(), CNormalLcm::remove(), CNormalSum::simplify(), test_biomodels217_expression::test_term_den1(), test_biomodels217_expression::test_term_den2(), test_biomodels217_expression::test_term_den3(), test_biomodels217_expression::test_term_den4(), test_biomodels217_expression::test_term_den5(), test_biomodels217_expression::test_term_den6(), test_biomodels217_expression::test_term_den7(), test_biomodels217_expression::test_term_num1(), test_biomodels217_expression::test_term_num2(), test_biomodels217_expression::test_term_num3(), test_biomodels217_expression::test_term_num4(), test_biomodels217_expression::test_term_num5(), test_biomodels217_expression::test_term_num6(), and test_biomodels217_expression::test_term_num7(). Multiply this product with a number. Definition at line 132 of file CNormalProduct.cpp. Referenced by createProduct(), CNormalGeneralPower::multiply(), multiply(), CNormalSum::simplify(), simplify(), and test_simplify::test_simplify_1(). Multiply an item to this product. Definition at line 235 of file CNormalProduct.cpp. Multiply a function to this product. Definition at line 209 of file CNormalProduct.cpp. Multiply an choice to this product. Definition at line 157 of file CNormalProduct.cpp. Multiply a general power to this product. Definition at line 183 of file CNormalProduct.cpp. Multiply an itempower to this product. Definition at line 261 of file CNormalProduct.cpp. References CNormalItemPower::getExp(), CNormalItemPower::getItem(), mFactor, and mItemPowers. Multiply a list of itempowers to this product. Definition at line 287 of file CNormalProduct.cpp. Multiply this product with another product. Definition at line 352 of file CNormalProduct.cpp. References getFactor(), getItemPowers(), mFactor, and multiply(). Multiply this product with a sum NOT CONTAINING FRACTIONS!. Definition at line 367 of file CNormalProduct.cpp. References CNormalSum::add(), CNormalSum::getProducts(), and mFactor. Multiply this product with a lcm. Definition at line 395 of file CNormalProduct.cpp. References CNormalSum::add(), CNormalLcm::getItemPowers(), CNormalLcm::getSums(), mFactor, and multiply(). Definition at line 512 of file CNormalProduct.cpp. Definition at line 79 of file CNormalProduct.cpp. Definition at line 457 of file CNormalProduct.cpp. Remove an itempower from this product, provided it is a factor of it. Definition at line 305 of file CNormalProduct.cpp. Definition at line 317 of file CNormalProduct.cpp. References C_FLOAT64, CNormalItemPower::getExp(), CNormalItemPower::getItem(), and mItemPowers. Definition at line 716 of file CNormalProduct.cpp. 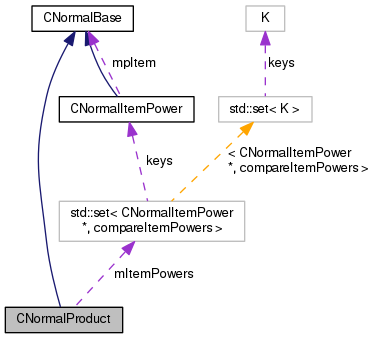 References CNormalSum::add(), CNormalProduct(), CNormalGeneralPower::getLeft(), CNormalGeneralPower::getType(), mItemPowers, CNormalGeneralPower::POWER, CNormalItemPower::POWER, and CNormalFraction::setDenominator(). Set the factor for this product. Definition at line 107 of file CNormalProduct.cpp. Referenced by createProduct(), and createSum(). Sets the item powers of this product. Definition at line 553 of file CNormalProduct.cpp. Definition at line 573 of file CNormalProduct.cpp. References CNormalGeneralPower::checkIsOne(), mItemPowers, CNormalGeneralPower::multiply(), multiply(), CNormalGeneralPower::POWER, CNormalItemPower::POWER, CNormalItemPower::setExp(), CNormalItemPower::setItem(), and CNormalItemPower::simplify(). Referenced by CNormalSum::simplify(), and test_simplify::test_simplify_1(). Definition at line 474 of file CNormalProduct.cpp. Definition at line 468 of file CNormalProduct.cpp. Definition at line 49 of file CNormalProduct.h. Referenced by getFactor(), multiply(), operator<(), operator=(), operator==(), setFactor(), and toString(). Definition at line 50 of file CNormalProduct.h. Referenced by checkSamePowerList(), CNormalProduct(), getDenominator(), getItemPowers(), multiply(), operator<(), operator=(), remove(), setDenominatorsOne(), setFactor(), setItemPowers(), simplify(), toString(), and ~CNormalProduct().